Career History: Riley was a notable figure on the wrestling scene for over 20 years and his career started in the 1920s. He won several titles including British and World Middleweight Champion before he built his own gymnasium called The Snake Pit. 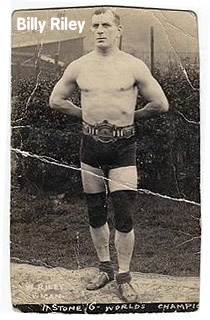 The gym produced many wrestlers of note including John Foley, Karl Gotch and his son Ernie Riley. He trained youngsters at his gym until he died in 1977.